People who enjoy playing high quality video slots and various other casino games will probably be interested in the brand new Miami Club Casino. This new casino, which was launched in 2012, uses WGS casino software and is operated by Deckmedia. Deckmedia N.V. is a company you might know since they are in the iGaming ..
People who enjoy playing high quality video slots and various other casino games will probably be interested in the brand new Miami Club Casino. This new casino, which was launched in 2012, uses WGS casino software and is operated by Deckmedia. Deckmedia N.V. is a company you might know since they are in the iGaming business since the year 2007. Since then they have launched and maintained various popular US Online Casinos including Sloto’Cash (RTG), Desert Nights Casino (Rival) and Slots Capital (Rival). Want to learn more about this online casino? Then continue reading! Ready to start and play? Then sign up your free account today and collect a 400% bonus up to $4.000,-. To be fair, we think most US orientated online casinos look not that good. Although this is the casino Miami Club really is an exception. When you open the Miami Club website you will be surprised with the clean and user friendly design. With the menu on the left (or top on mobile) you can easily switch between the available game categories. You can for example choose to only view the video slots, video poker games or table games. In addition to this you can use the top menu to login, sign-up, view the current promotions or look up information about getting started. All with all Miami Club looks like an inviting online casino with a nice Miami theme which we think a lot of people will enjoy. US Players are accepted at Miami Club Casino. Instant play and desktop download available. Interesting selection of casino games by WGS. Many weekly promotions and bonuses. Support (Live Chat) available 24/7. Long stretches of white beaches, perfect blue water and palm trees. That defines the magical city Miami. Miami is a place where everything is about enjoying yourself. This feeling is the same feeling as Miami Club Casino wants to offer you. This online casino is all about fun and focused on elite players which like high quality casino entertainment. Miami Club Casino is the choice for US players which want to enjoy amazing bonus offers, gaming software by WGS and exciting tournaments! As said before Miami Club Casino uses WGS Casino Software which ensures players enjoy a wide and diverse game portfolio. A lot of WGS games are hard to find and that’s why Miami Club might be an interesting casino for some players. One of the most popular game types by WGS are the three reel slots. All these games offer only 1 payline on which you can win big. All these games with one payline are very easy to play and that why many people love to play them. On top of the selection with three reeled slots Miami Club also offers a wide selection of video slots with up to 5 reels. Most of these games offer between 20 and 30 paylines which makes it easier to get a winning spin. Some of the most popular choices in this game category are the California Gold slot, the Beat the Bank slot and Agent Cash. A few other games I really like are the Black Magic Slot and Jurassic Slots. Curious about the whole portfolio of five reeled slots? Then open the Miami Club website and have a look at the game lobby. Ready to win big? Then make sure you have a look at the portfolio of Jackpot slots. At the moment Miami Club offers around ten Jackpot Slots with top prizes up to $150.000,-. You can win these amazing Jackpot simply by playing, even on a low stake. A few of the most popular Jackpot Slot are Mega-Money Mine and 7x Lucky Sevens. At Miami Club Casino you will not only find an interesting selection of (video) slot games, you can also play various video poker and table games. At this moment Miami Club offer 20+ types of video poker games including the popular game types Aces and Faces, All American Video Poker and Jacks or Better. Some of the games are also available in a multi-hand version which might be fun to increase the excitement and stakes. All with all you will be able to enjoy a decent selection of video poker games. In addition video poker you will also be able to play table games at Miami Club including Blackjack, Roulette and Craps. Blackjack is available in multiple versions including the popular game versions Atlantic City Blackjack and Vegas Strip Blackjack. If you like to play Roulette then you will be able to play the European of American version of the game. Next to Roulette and Blackjack Miami Club also offer variety games including Craps, Red Dog, Tri-Card Poker and Progressive Caribbean Stud Poker. If you like to play casino games on your smartphone or tablet then Miami Club Casino is a good choice. At the moment Miami Club Casino offers a simplified mobile website with the same style as the desktop website. On the mobile website you will find around 25 five reeled video slots which are fun to play. On top of these games the mobile casino also features a dozen of classic slots (3-reels), video poker games and some table games. You will even be able to play Keno on your Android or iOs device. Although the selection of games is not very huge at the moment, the mobile casino works good and the number of mobile slots gets bigger every week! If you like to collect this bonus then you can do this in a few easy steps. In order to start you will first need to open the Miami Club Casino website. You can do this by clicking this link. Once done you will need click ‘’Play now’’. After you have done this you will need to sign up your free and personal casino account. This is very easy and only takes you a few minutes. Now your account is ready you can make your first deposit. At Miami Club Casino you will find various safe payment options which you can use for free. After you finished your payment Miami Club will add the 400% bonus to your account automatically. Ready to get doing? Then start registering your free account on this page! In addition to the 400% deposit bonus Miami Club Casino offer plenty of other promotions. With these promotion you can claim more bonus funds and reload your balance. Below I will explain which are the most important promotions at Miami Club. 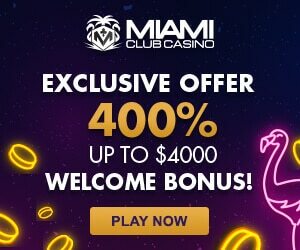 When you don’t like to play with promotions you can always decide to deposit without using a bonus at Miami Club Casino. On top of the daily reload bonus Miami Club Casino also offer you a normal daily bonus. You can claim this bonus on any deposit, any time of any day. Depending on your member status this bonus will be somewhere between 20% and 45%. You can claim the bonus by simply making a deposit and selecting the ‘’Daily Deposit Bonus’’ using the radio buttons. This really makes playing at Miami Club worthwhile! Deposit at least $10,- to qualify for this bonus. At Miami Club Casino you will also be able to enjoy a 25% monthly bonus rebate on any net losses. This bonus will be credited within the first three business days of the new month. In order to qualify for this bonus you will need to meet certain requirements. Your account balance must be below $1,- for example and you must have less than 2.000 rewards point in your account. Have a look at the Miami Club Casino website for more information about the rebate bonus. As a regular customer of Miami Club Casino you can take advantage of the loyalty program. With the Miami Club Loyalty Program you can enjoy premium rewards, bonuses and extra benefits. How it works? Simply play at Miami Club Casino in order to begin earning reward points. While collecting more and more points you will be able to upgrade your status which ensures your rewards and bonuses will be better and better. A nice way to reward loyal members of the casino! After collecting a bonus your balance will normally be subject to a 20x wagering requirement. This means you will need to rollover your deposit and bonus a total of twenty times before you can cash out your balance. When you for example make a $100,- deposit, and claim a $400,- bonus, you will need to wager a total of 20 x ($100,- + $400,-) = $10.000,-. Once you wagered this amount your balance will be all real money which means you can withdrawal it. We recommend you reading the bonus terms and conditions before claiming a bonus offer. In this way you fully understand how the bonus works, and how much effort it will take to wager it. When you want to start playing at Miami Club Casino you will need to make a first deposit. At Miami Club you can use one of the many reliable payment options to upload funds in your account. Some of the most popular payment options are VISA, Mastercard, SoFort and ecoPayz. You can use these payment options from as low as $5.- to $35,- per transactions. All these payment options are free, so you will pay no fees. Please note you cannot use VISA, SoFort or Mastercard to withdraw money from your account. Miami Club Casino also offers a few payment options including e-Wallets. 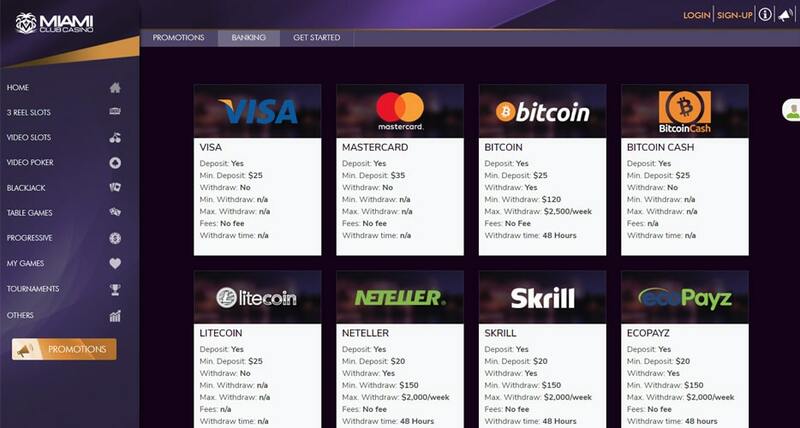 Both Neteller, Skrill and PaySafeCard are available. You can use these payments from a low as $1,- per transaction. All e-Wallets are free to use and you can cash out up to $2.000,- per week. In normal cases the withdraw time is 48 hours. Enthusiast of cryptocurrencies are by the way also more than welcome at Miami Club Casino. At the moment Miami Club accepts payment using Bitcoin, Bitcoin Cash and Litecoin. Using these cryptocurrencies you can deposit $25,- or more. If you like you can even cash out your winnings in Bitcoin. When you withdraw funds using Bitcoin it will take up to 48 hours. There is a maximum cash out limit using Bitcoin of $2.500,- per week. After winning money in the casino you can also choose to withdraw money using Check and Bank-Wire. Withdrawals using these options are available from $150,- or $160,- per transactions, which is a bit high in our opinion. Both these options will also cost you a few of $30- or $60,-, which is also a lot. Because of this we only recommend using the withdrawal options when you make a big cashout. Although Miami Club Casino offer no phone line we are pretty satisfied with their support policy. When you have a question or a complaint you can contact the customer support department around the clock (24/7). The easiest way to get in touch with a support agents is by using the live chat. In this chat you can ask your question and a casino representative will answer it within a few minutes. This makes the live chat perfect for non-complicated (quick) questions. When you have a more complicated problem or question you can also decide to send an email to Miami Club Casino. The current email address of the casino is support@miamiclubcasino.im. After sending you message the casino will respond as quick as possible (normally within 24 hours). For more information and a small F.A.Q. please visit the Support page on the Miami Club Casino website. Although Deckmedia is a company which has a very good reputation one thing about Miami Club Casino could be improved. At the moment the software Miami Club Casino uses (WGS) is not audited by an independent testing agency. At least, there are no document published about an exam. Although this is the case there is no reasons to suspects that the games are not fair. One of the reasons why we think the games are legit is that other casinos that are part of Deckmedia are proven fair and reliable. This show the company is a fair and reliable partner to do business with. User-friendly online casino which offers an amazing good looking Miami theme. Wide selection of safe payment options including VISA, Mastercard, e-Wallets and Cryptocurrencies. Both instant play and download casino available. Enjoy daily reload bonuses, a generous welcome package and a unique VIP program. Play 100+ different slots and table games, video poker, roulette and more. Miami Club Casino is secured by an state-of-the-art SSL encryption. Enjoy support around the clock. Live chat and email support available. Play anywhere you want in the Miami Club Mobile Casino.